Multiple enhancements to the Proposition Filter rule type extend the functionality of proposition filters. You can select a strategy rule that contains an External Input shape when you configure the filter or the default behavior criteria in a Proposition Filter rule. You can apply the default behavior criteria to propositions that are outside the scope of a Proposition Filter rule to evaluate their eligibility. You can use strategy rules that have an External Input component when you define the proposition eligibility criteria on the Filter criteria tab or the Default behavior tab of a Proposition Filter rule form. 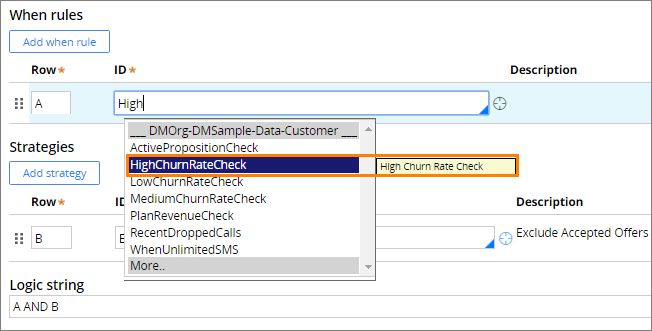 For example, you can use a strategy with an External Input component to create the filter criteria or default behavior criteria for filtering out all propositions that a customer accepted within a certain time period. The External Input component imports the appropriate propositions to the strategy to make decisions. 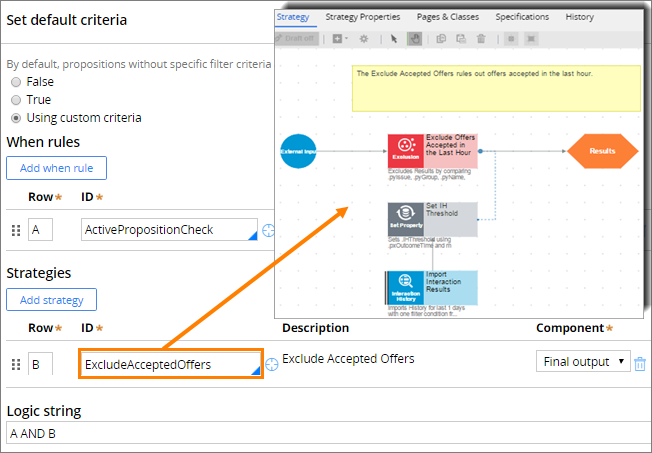 In a Proposition Filter rule instance, you can set the default behavior settings for propositions that do not match any specific filter criteria defined in that rule instance. Previously, the default behavior criteria applied only to propositions in the business issue or group that is defined in the Proposition Filter rule. Now, the default behavior criteria extend to propositions that are outside the business issue or group that the rule instance applies to. Proposition Data – Imports all propositions from the Sales business issue. The Sales business issue contains propositions that belong to the Phones, Tariffs, and Offers groups. The total number of propositions in the Sales business issue is eight. Filter – References a Proposition Filter rule instance that applies to the Phones group. That rule instance filters out all propositions from the Phones group. The default behavior criteria specify that all propositions that do not match the filtering criteria are eligible. When this strategy is executed, the Proposition Filter rule filters out the propositions from the Phones group to reflect the filter criteria specified in the rule instance. Additionally, according to the extended default behavior criteria application, the Proposition Filter rule processes the propositions from outside its scope and evaluates the propositions from the Tariffs and Offers groups as eligible, because they did not match any of the filter criteria. 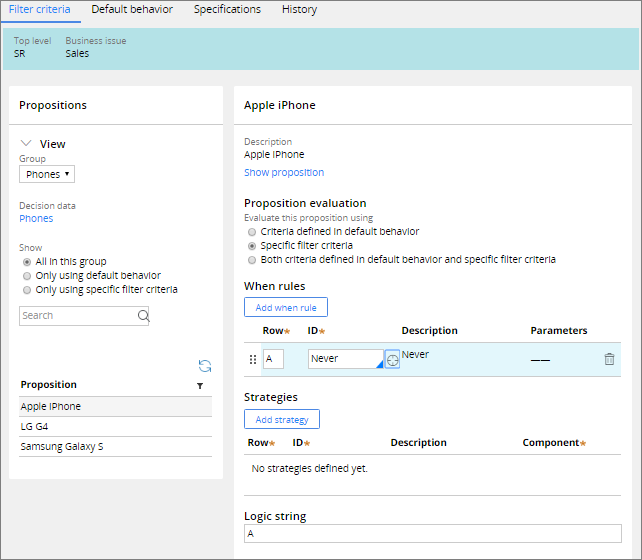 You can view the labels for the selected strategy rule and when rule when you configure a filter or the default behavior criteria in a Proposition Filterrule. To find the when rule or strategy rule that you want to use, begin entering its name or label, and select the rule from the autocomplete list. To analyze the configuration of a Proposition Filter rule in a strategy, perform a single case or batch test run.